We can really ramp up our development speeds using Amazon EC2 Container Service, cutting our build and deployment times by 50% or more. With Amazon ECS, we have a very stable platform that allows us to dramatically scale our products. Linden Lab is a San Francisco-based Internet company best known for its Second Life virtual world that provides a platform for users to generate and interact with 3D content. The Second Life virtual world can be accessed through Linden Lab’s client programs or via alternative third-party viewers. The company’s other offerings include Blocksworld, which lets users build and play with virtual 3D blocks, and “Project Sansar,” the code name for a new platform for virtual experiences that is scheduled for release in 2016. Company had created products that used immutable host images running on bare metal servers. The applications were monolithic and images took up to 15 minutes to deploy. For Project Sansar, the company chose to use Docker containers for increased speed and consistency between environments. Wanted to run Sansar at scale and needed efficient, fast cluster management and container orchestration. Initially evaluated a range of open-source tools, but encountered failures, immaturity, instability, and management difficulties. Started using Amazon EC2 Container Service (Amazon ECS), a scalable, high-performance container management service that provides cluster management and container orchestration. The company runs the containerized web applications and backend services of Project Sansar across clusters of Amazon EC2 instances. Built a custom scheduler for scheduling containers with specific PCI restrictions and CPU/memory requirements. Built a continuous integration and continuous delivery pipeline into Amazon ECS using Jenkins and Drone.io. 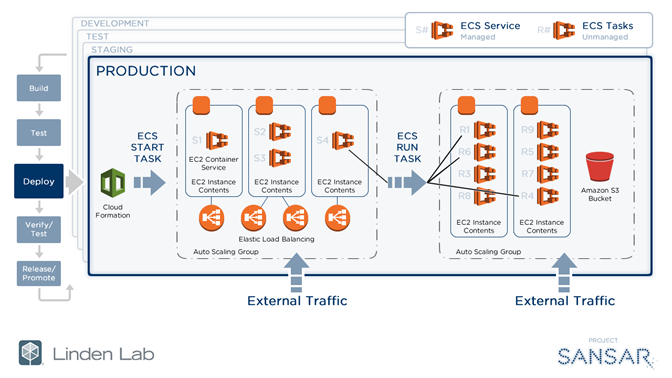 Uses Elastic Load Balancing for automatic load balancing of traffic across containers and AWS CloudFormation to provision all Amazon ECS clusters and related resources. Amazon ECS eliminates the need to install software and operate servers; this reduces overall management needs for running containers at scale and helps speed time to market. Faster speed and efficiency in moving to containers, averaging one to two minutes for builds and one to three minutes for deployments—about 60 percent faster than previous build/deployment tools. Service is more stable and production ready. To learn more about streamlining the orchestration and management of containers, visit the Amazon EC2 Container Service page.